It’s that very most favorite project of mine around this time of year … planning the Potager (vegetable garden) and ordering seeds! It doesn’t matter if you are in cold country or closer to the equator I’ve found, one still gets the gardener’s itch. Yes, even though I try to have some amount of discipline and control, I went crazy! It’s time I revamp most of my seeds anyhow and well, they are stored in a box in a dark closet in my (frozen) house so how viable will they be anyway? I’ll find out. Yet, one more gardening experiment. Last year I stored my seeds in our heated garage so technically they did not freeze because the garage remained heated while we were away. 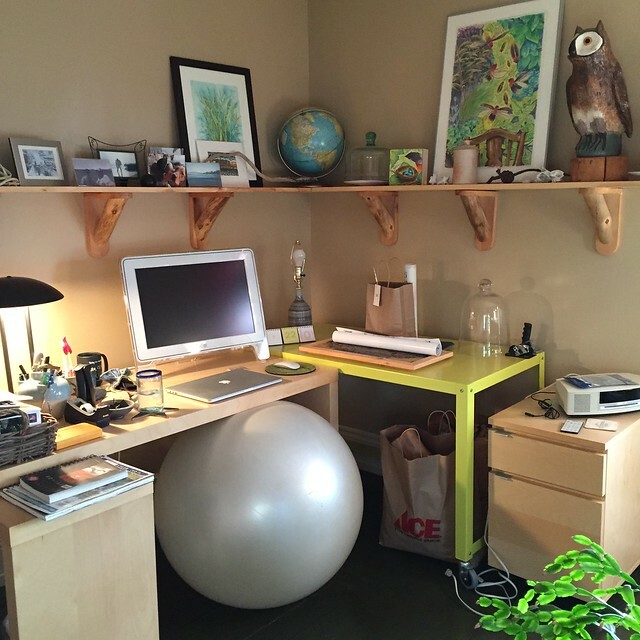 Before I migrated, I managed to move my office/studio to a slightly larger room in the house and I set up my seed station so that I am ready to start seeds the day after we get home? Last year I started seeds in my little greenhouse but I think it was still a little too cool to get things off to a really good start so this year I am going to germinate them indoors under lights and when I pot up they will go into the greenhouse. That is my strategy anyway. ​Thank goodness I am not returning home to this! Now I’m actually looking forward to getting back to my newly moved and reorganized office. My seed station is to the right in the photo above in front of another window. This year I’ve gone back to some of my favorite seed sources. Although Baker’s makes me drool – I mean, that catalog! – I don’t think the seeds do as well for me because of climate and locality as Johnny’s or High Mowing. It is from Johnny’s and High Mowing that I’ve ordered the bulk of my seeds from this year. I also ordered lots of flowers from Renee’s and even though she is in California, her seeds have always done well for me perhaps because most are annual flowers geared to grow fast? 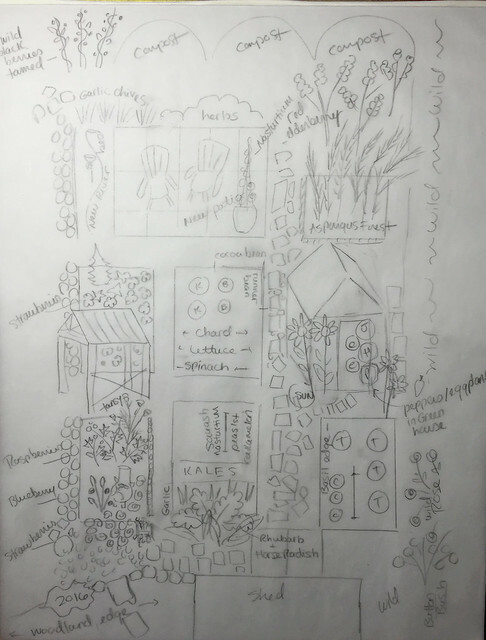 Here it is my annual sketch/plan for the Potager, before I delve into my plant list for 2016. You can view previous years here, here, here and here. I am still missing 2014 (that was the COLD year that I didn’t escape even for a week). It’s fun to see the changes in the Potager over the years. You can click on this year’s plan to zoom in. ​So, what am I growing? I enjoy peas early in the season. Not so much radishes but I am going to try some again. I am also going to try cucamelons again because they are just too cute and too fun. I like squash but we can get wonderful squash from the nearby farms, still so much fun to grow your own. I am into colors so I have begun mixing colors i.e. black, red, gold tomatoes or purple and white eggplant or green and purple basil. Aside from that, the darker more colorful varieties are tooted to be higher in nutrients or antioxidants so win, win. So, here is the list. I’m going to make use of the greenhouse now that I’ve evicted the hornets. I will grow some things in large pots I’ve saved from purchasing shrubs. I prefer growing pole beans. I grow a staple of FLOWERS in the Potager as well. I like to mix Morning Glory on the trellises so when a vegetable vine is done there are still some pretty flowers to look at. I’ve also mixed in Cathedral Bells in the past – beautiful. The Morning Glory just comes back so no extra work for me. Nasturtium is a must for eating, and companion planting. Calendula reseeds itself valiantly as well as Borage. Borage is a bee magnet. I will also try, try, try to tuck in some Sunflowers! Ants be damned. Last year they toppled their stems like trees by chewing around the base but hey, I moved that entire raised bed to the other side of the Potager so probably will not have ants again (I hope). I am very excited for another year of gardening – THIS IS THE YEAR I can finally harvest my Asparagus – and can’t wait to also try out my new patio right in the garden so I can watch everything grow!